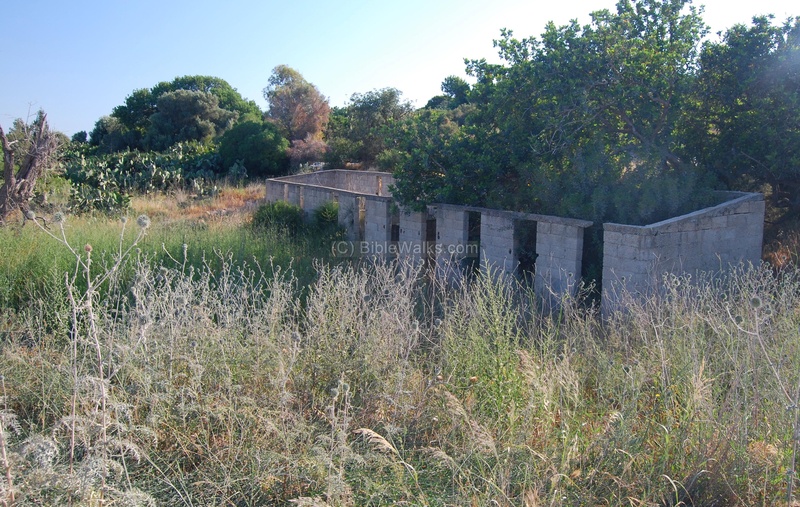 Ruins of an ancient village on a sandstone ridge south-east to Atlit, along the coast road. 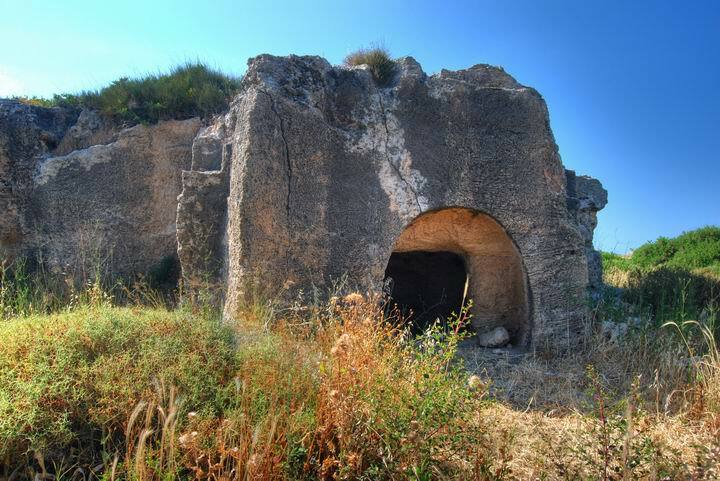 The site started as a large stone quarry, then used for burial caves and agriculture installations. 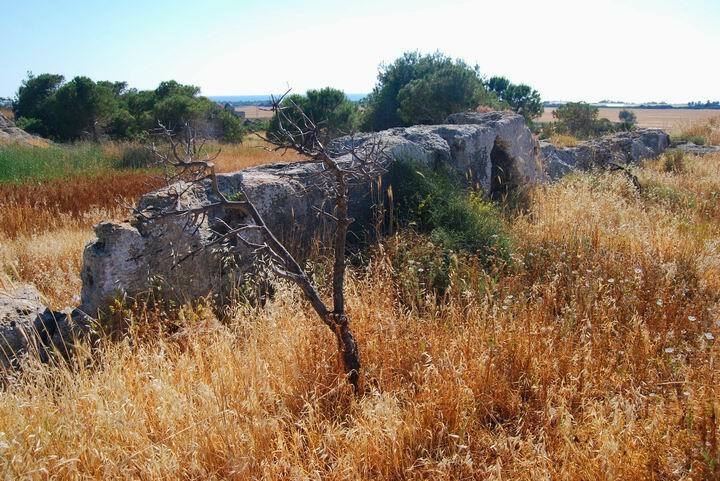 Ruins of an ancient village on a sandstone ridge south-east to Atlit. The site is spread over two hills along the east side of the freeway. 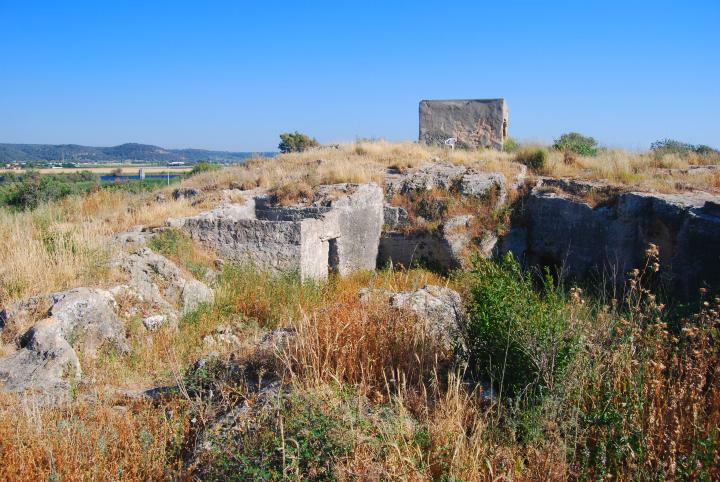 The site started as a large stone quarry, then used for burial caves and agriculture installations. Its name means "tower of salt", called after the salt industry which exists here for thousands of years until modern times. Most of the pottery findings in the archaeological survey are from the Roman/Byzantine periods. 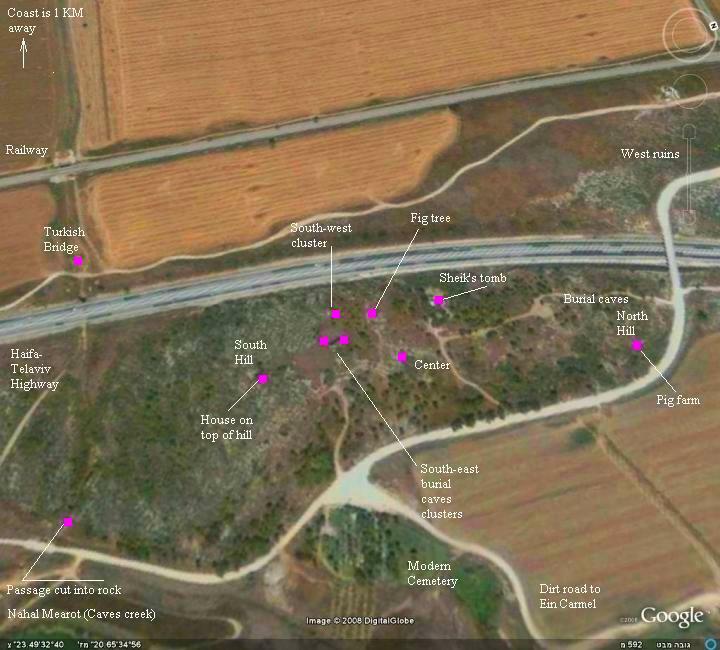 The following aerial view shows the site, which is located south to the modern village of Atlit. 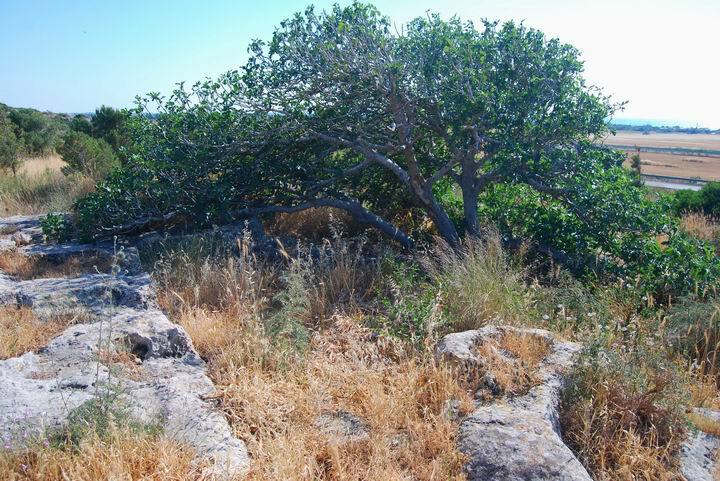 The site is located along the Haifa-TelAviv freeway. The major part is on the east side, although there are ruins also on the western side of the highway. To get to the site, drive through Atlit towards Neve Yam. Before crossing the railway, turn east and cross over the highway on the service bridge. Drive along the site and park near the Ein Carmel cemetery. You can point on the purple points to navigate to the selected point - in this page and other pages. 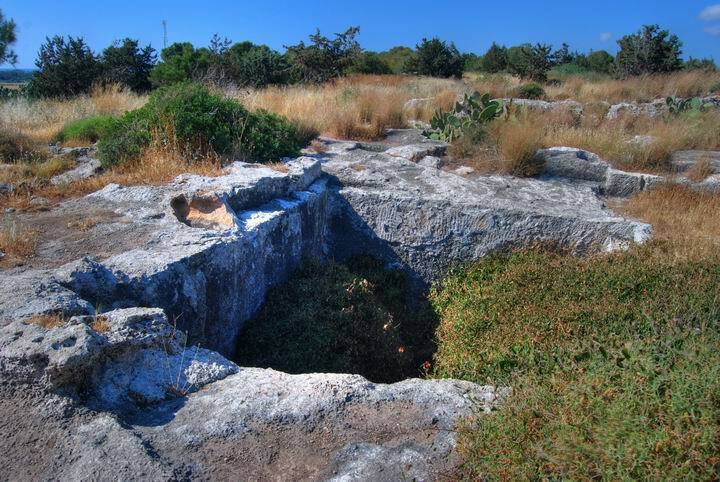 The area of the site was populated in the Upper Paleolithic period (40,000 to 16,000 BC) and the Neolithic/Chalcolithic periods (8,300 to 4,500BC, 4,500BC to 3,150BC). Flint stones were found at a hill south to the site (site #133 in the Archaeological survey). The settlements then ceased until the Persian period (6th C BC), so there were no sites in this area in the Canaanite and Israelite times. 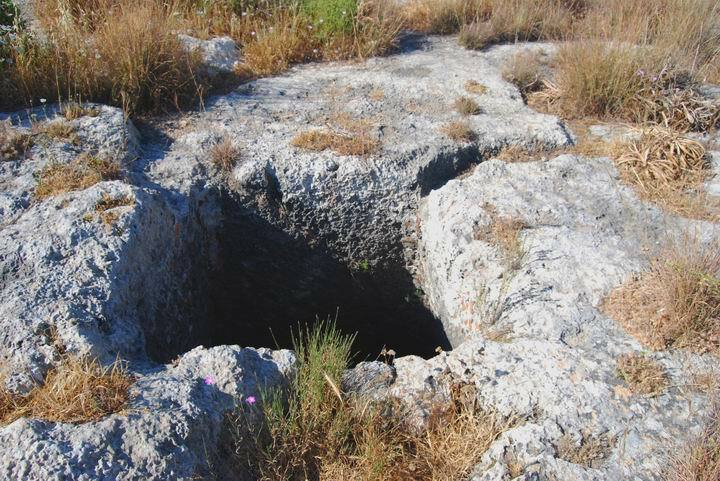 During the Persian period (6th - 3rd C BC) the number of sites along the coast of the Carmel, and particularly in the area of Atlit, grew to dozens of sites. The new establishments were probably Phoenicians who settled along the coast. The Phoenicians were the maritime merchants of the ancient world, and used the natural bays and the nearby rivers in order to establish ports along the shores of the holy Land - stretching from Tyre down to Gaza. The villages along the shore supplied food, fish and stones to the rich port cities. 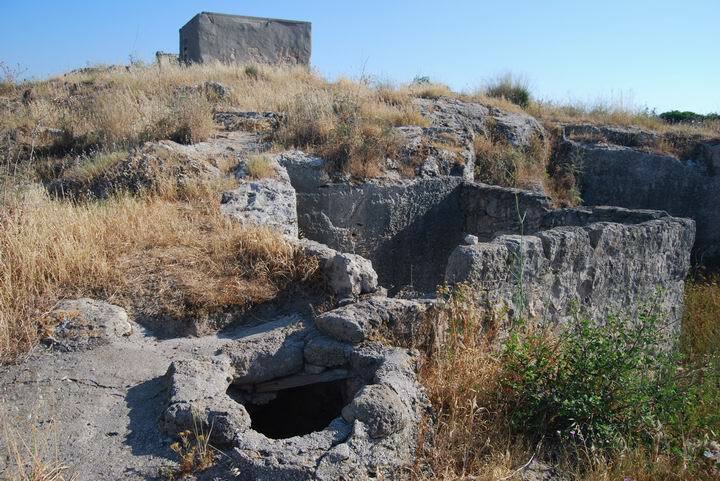 Most of the villages were medium size (10-30 Dunam each). One of the main problems of the settlements were the swamps between the sandstone ridges and Mount Carmel. The water from the creeks could not pass through the ridges, and the swamps made the life in these villages unbearable. A major engineering project, on a government level, was conducted at an unknown time, perhaps during this Phoenician settlement. The engineers cut 4 water passes through the ridge, draining out the water. Such a pass exists on the south side of Migdal Malcha. During the Hellenistic, Roman and Byzantine periods, the stone cutting industry flourished in a growing demand for quality building blocks. The sandstone ridges along the coast of the Carmel became one of the major stone cutting centers, supplying stones for the newly established Herodian Caesarea and other cities. Villages of stone cutters were established on the dozens of sandstone (Kurkar) hills along the coast of the Carmel. In addition to stone cutting, they were also fishermen and supplied services to the trade route that passed on the side along the ridge. After the stones were cut away, the remaining parts of the hills were reused for digging grand burial caves. 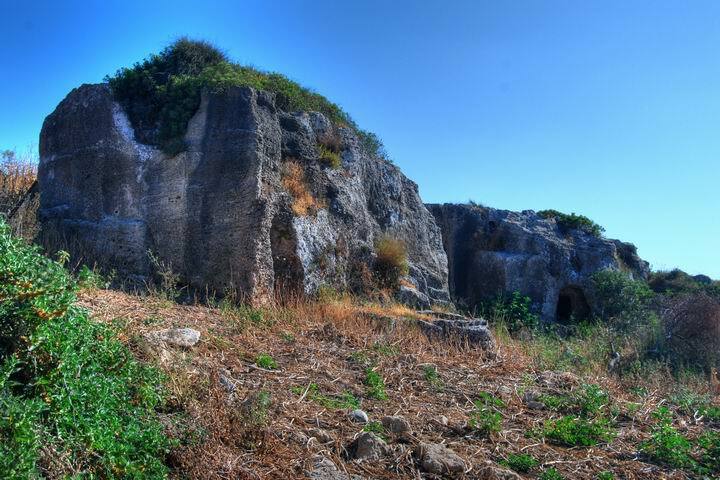 The site is dotted with dozens of rock-hewn burial caves. Additionally, there are agriculture installations such as wine presses, cisterns and wells. In the 2nd C Jerusalem Talmud, the village is listed in the edge of Caesarea. According to the archaeological survey, most of the ceramics are from the Roman/Byzantine period. Note that another location for Migdal Malcha is in Tel Tanninim. Perhaps the modern name of this site was misplaced with the other site. The sites in the area were destroyed in the 7th C, after a short Persian period and the Arab conquest. The Crusaders continued with grand projects along the coast road, and the area of their great fortress Atlit once more flourished. The Crusaders protected the pilgrimage road to Jerusalem and established military police stations along the road. In the site there are no findings from that period, but they probably have used the place as part of the defense along the coastal road. 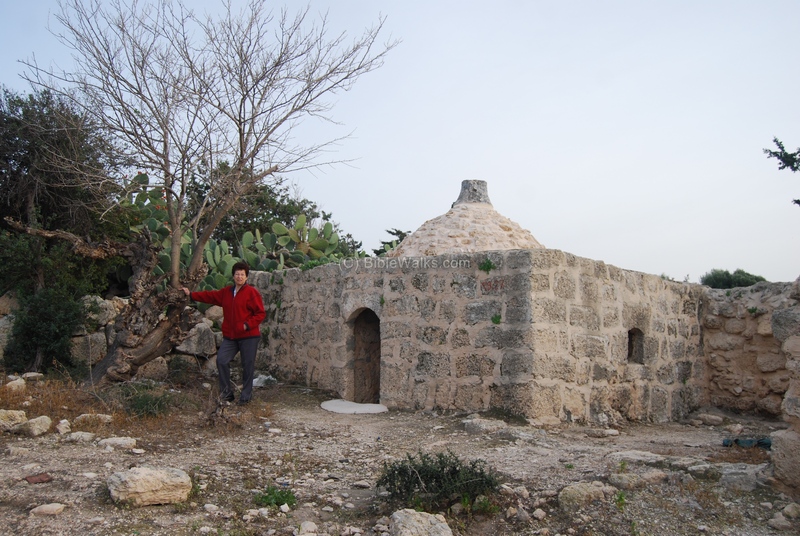 After the Crusaders left the Holy Land (their last post was Atlit), the Mamlukes destroyed most of the sites along the coast, so few remains are from this period (13th through 16th C). 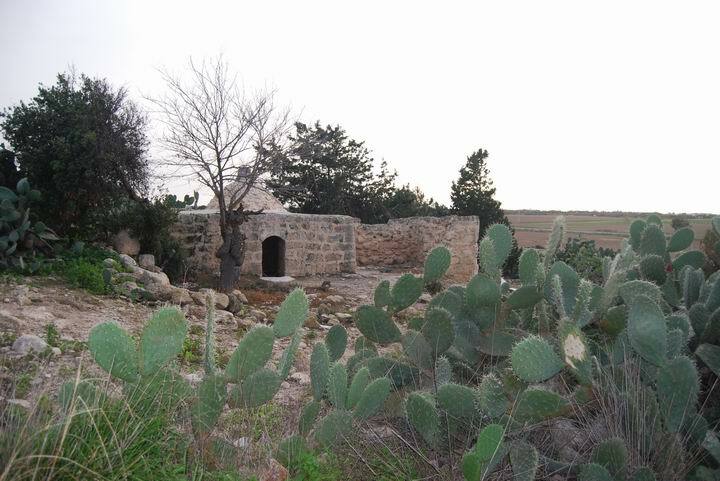 In 1926 a small number of Armenians refugees settled on the hill (the site was known as Sheikh Breiq, Ibreiq or Abrek). They relocated in the 1980s, leaving behind several graves on the north hill and some structures. The site was cleaned by the Regional municipality, and is totally deserted. The easy access to the site makes it an exciting place to visit on a weekend -sort of an undeveloped archaeological adventure park. It is advised to take special precaution from the open pits and cisterns, and wear long pants (due to the thorns) and high shoes (possible snakes). An aerial view of the site is seen here from the south. 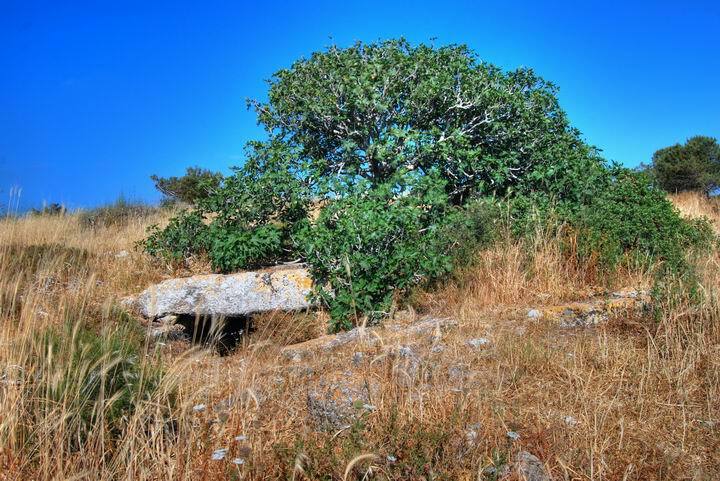 Most of the site is covered by a low bush. The coastal highway is on the left (west) side, with the sea not far away. The city of Haifa and Mt Carmel are on the far background on the right. The ruins of a modern structure are located on top of the southern hill, as seen below. On the far background are the western slopes of mount Carmel. 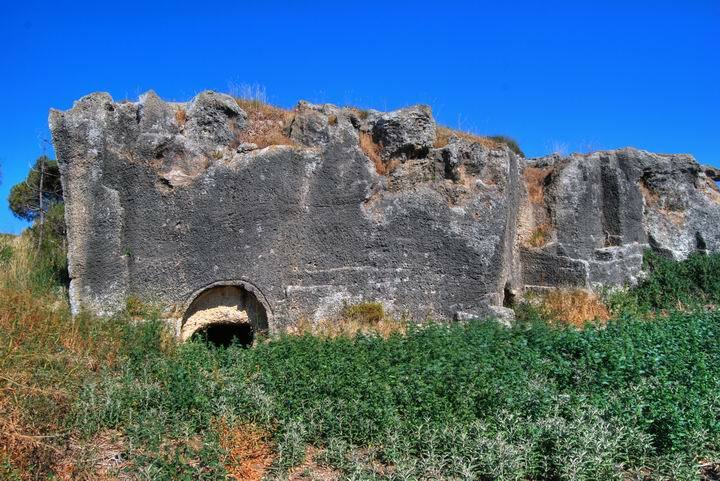 Modern walls were added around burial caves, which were transformed into storage rooms. 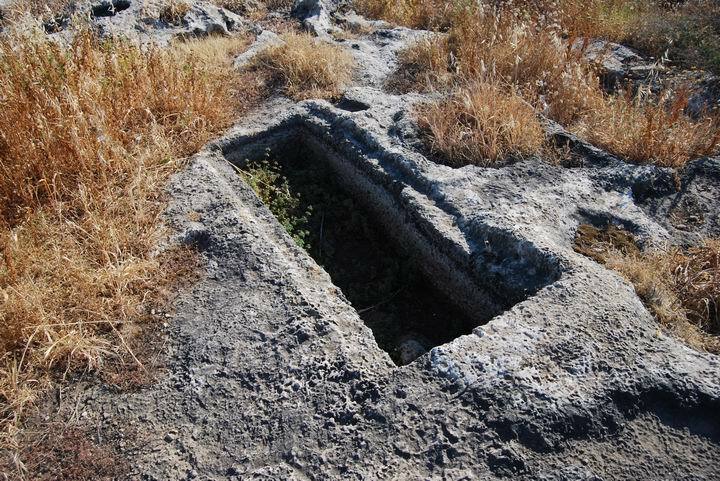 A number of box tombs are located on the western side of the lone structure. 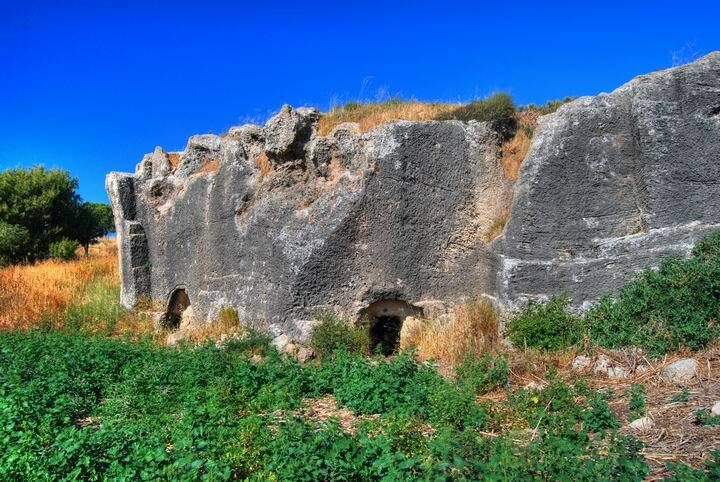 A set of double arched burial caves are located nearby inside a burial shaft. A deep well collected the water at the top of the hill during the winter season, then provided the drinking water. 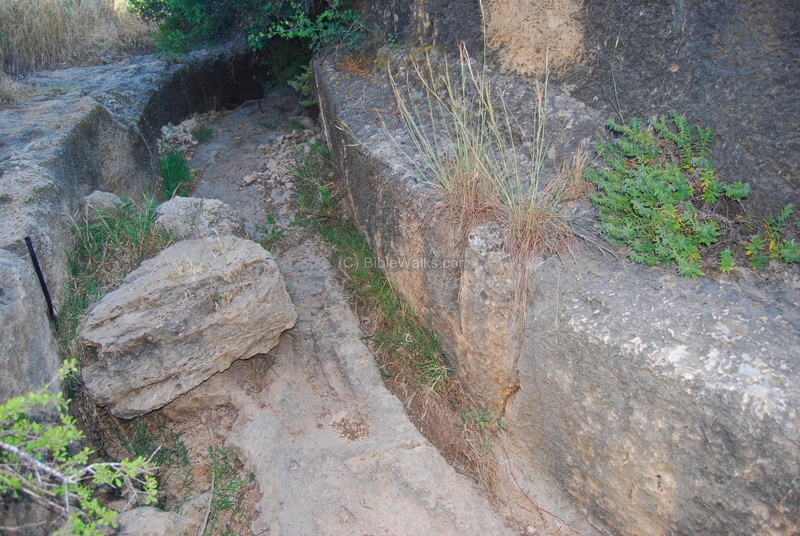 Signs of the ropes that brought up the buckets of water are seen on the edge of the cistern. In the center of the south hill are a number of installations. In the photo below - a large and deep underground room cut into the bedrock, with other cisterns around it. 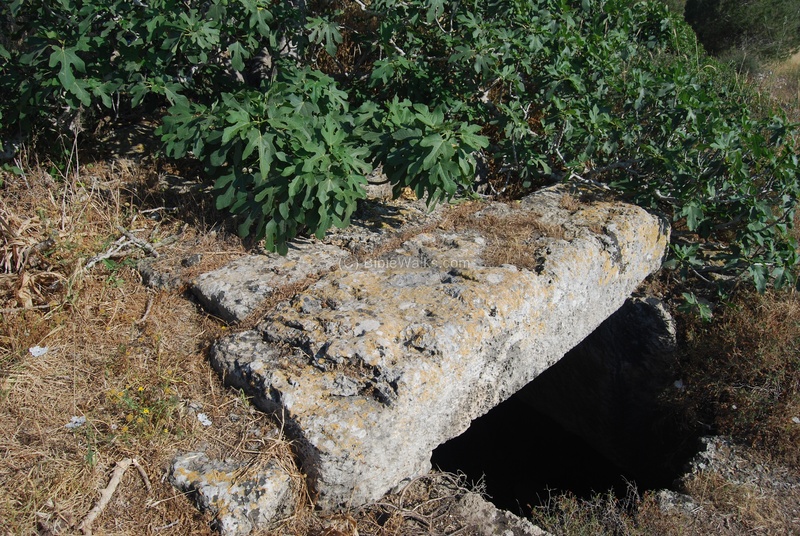 In the photo below - A bell-shaped cistern and channels leading to it. A view of the center of the south hill, with a rock-hewn wall, left from the quarried bedrock. The coast is seen in the far left background. 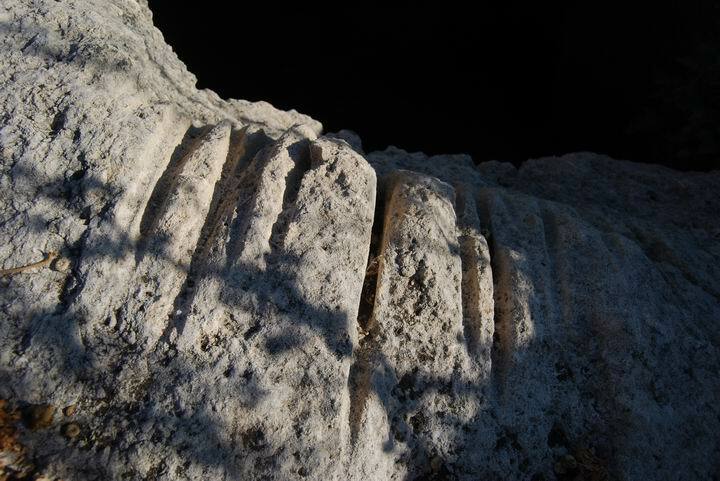 In the photo below - a large winepress and cavities left from the quarry. In the southern hill there are many clusters of burial caves, which were cut into the sandstone quarry after it completed its commercial purpose. 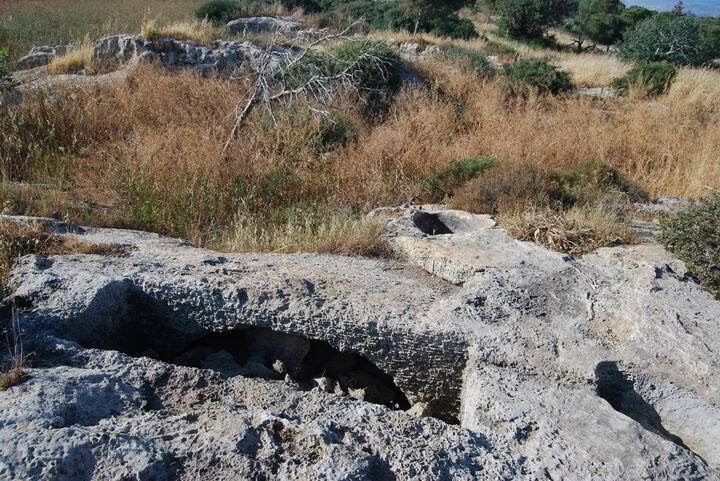 The photo below shows a west-view of a cluster of burial caves. Another view of this cluster from the south side, where another rock-hewn tomb is seen. Uncle Amnon, who led us through the site, is seen here resting near the cave. The exploration of the site took us about 2 hours, which were both exciting but exhausting. Another cluster is located a few meters to the south. 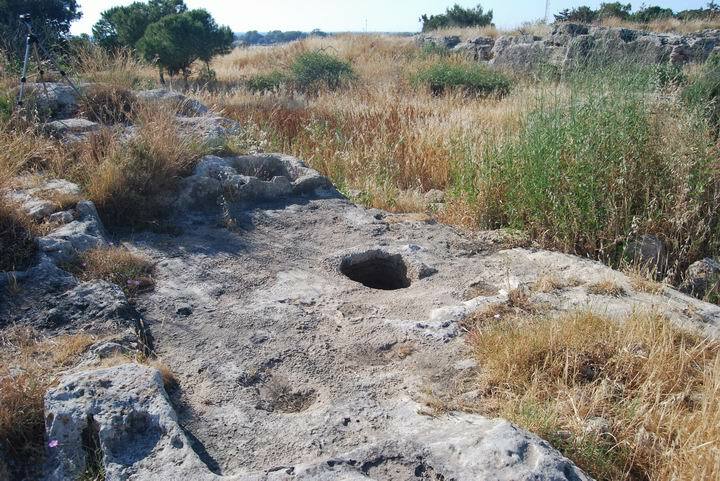 The photo below shows a number of burial caves (Site #124, plan 2, items #16-20). 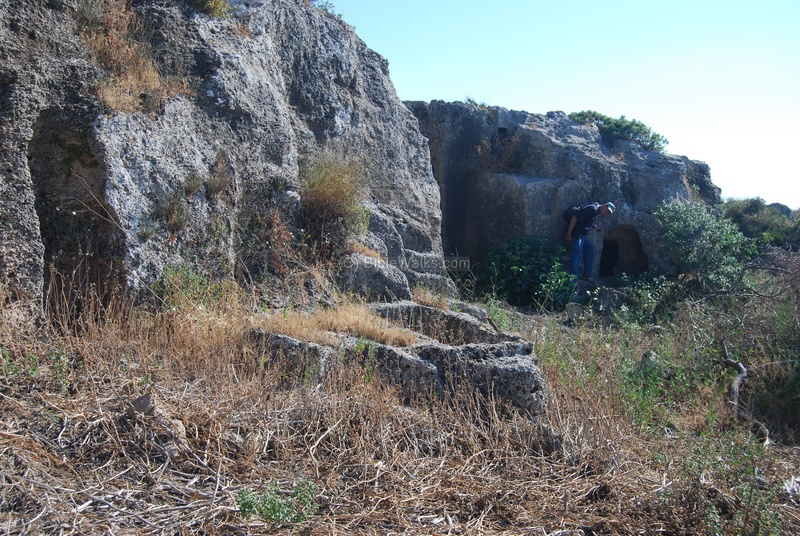 A closer view of the burial caves, with a rock-hewn box tomb in the center. 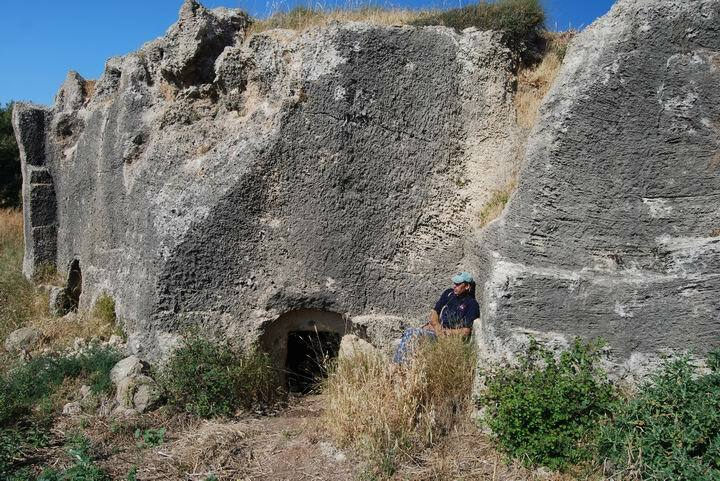 Uncle Amnon measures the box tomb in the photo below (Site #124, plan 2, item #19). On the north side of the south hill is an underground structure (Site #124, plan 2, item #3). Its purpose is not clear. A fig tree grew out of the structure. The photo below shows the site from the north-east side. On its far right background is the coast of the Med sea. The structure is seen here from the west side. A closer detail of the roof, which is composed of large blocks of stones. 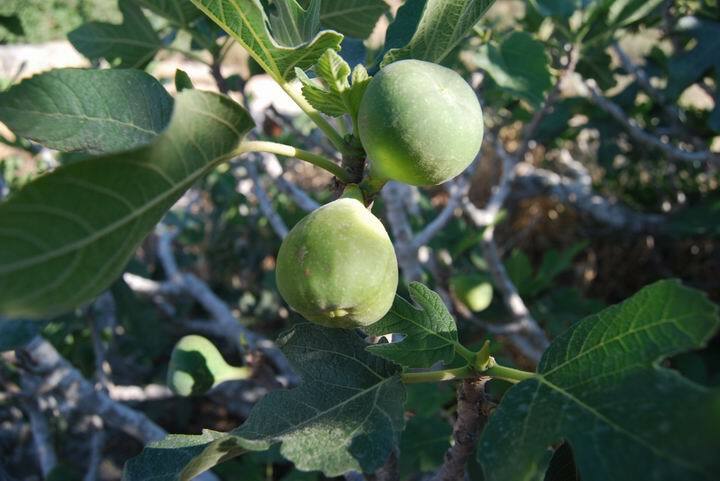 A closer look on the fig tree fruits. 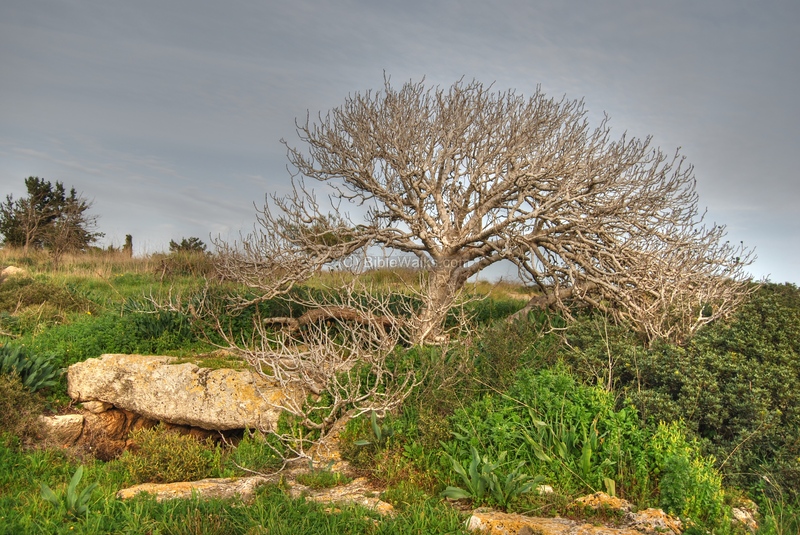 During winter time the fig tree leaves wither, but it still stands out as a pretty sculpture. As in Isaiah 34 4 (NASB version): "As a leaf withers from the vine, or as one withers from the fig tree". 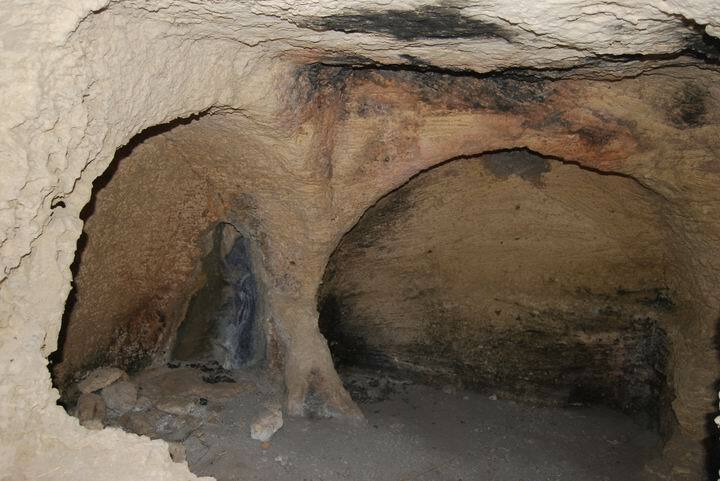 An inside view of the of the burial caves. In the center of the site is the Holy tomb of Sheik Bureik (Abrek, Brak). Abrek means "small vase" in Arabic, and is according to an Arab Tradition associated with a legend about a believer who frequently washed his hands with water in the pitcher. 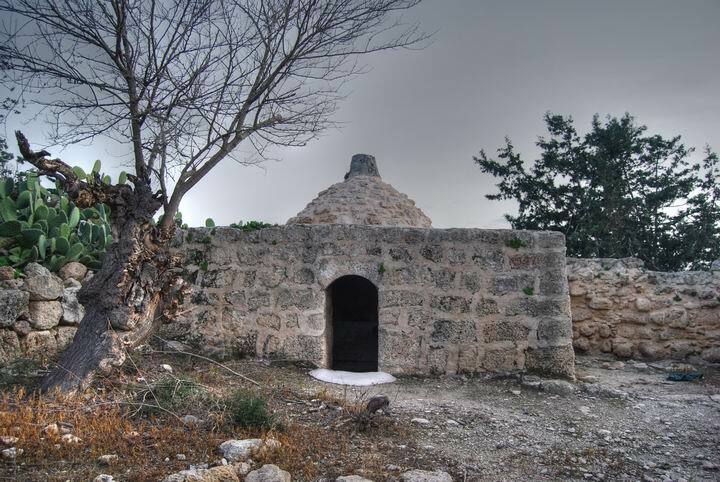 Note that another Sheik's tomb - with the same name - is located in Beit Shearim. A small village at that site was also called Sheik Ibrik, as this site is called, so there were two villages with the same name. Another view of the tomb is seen below. On the north hill there are also tomb caves, cisterns, mosaic floors and installations. One of the wine presses is seen on the photo below. A modern structure stands on the west side of the north hill. This structure was a pig farm. On the south side of the site is an ancient water pass that is cut into the sandstone. It was curved out in the Roman period or earlier, as many other water passes in the area. The pass allowed the waters of the Caves creek to pass through the sandstone ridge and flow into the sea, thus draining out the swampy area between the ridge and the foothills of the Carmel. See another pass in Dustrey pass which is located 5KM to the north. The creek flows under the Tel-Aviv/Haifa highway and flows westwards into the sea. 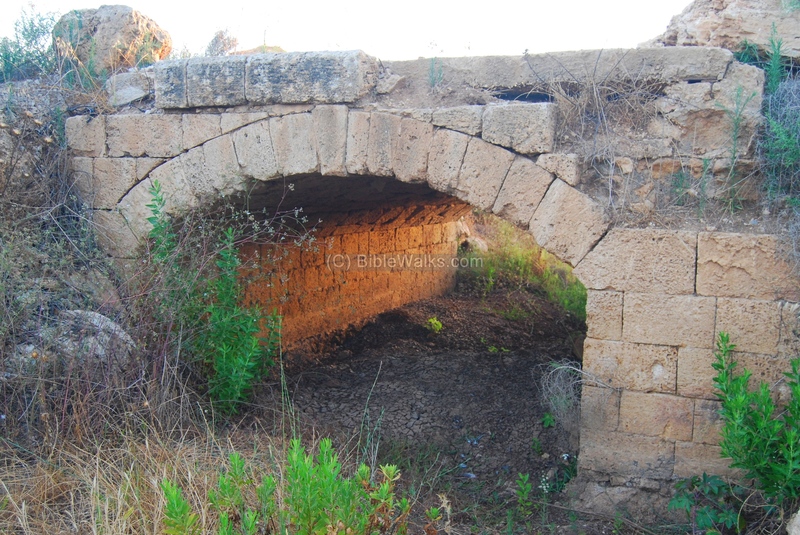 Just after the highway is a Turkish bridge, so the ancient road passed very close to the modern road. The bridge was constructed during the historic visit of the Kaiser Wilhelm II - the last emperor of Germany and King of Prussia - and his wife Augusta Victoria, who sailed to Haifa and rode on a carriage to Jerusalem (1898). 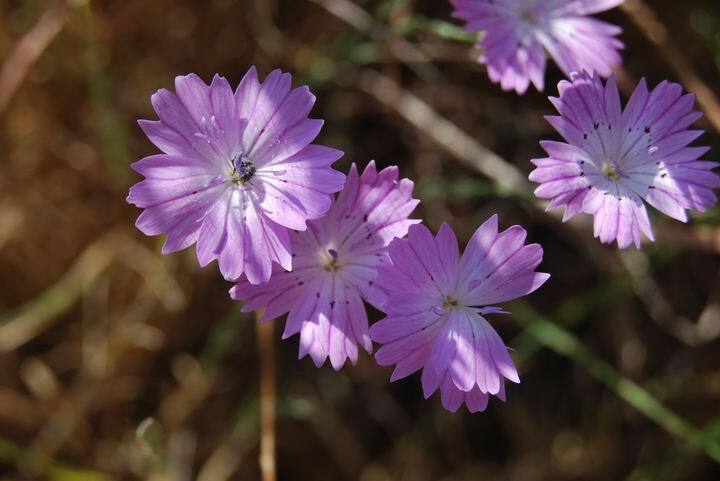 During spring time the site is covered by wild flowers, such as the one seen below. According to Uncle Ronnie, our flower expert, the flowers belong to one of the flower varieties called "Oriental Viper's Grass" (Scorzonera papposa) and in Hebrew: "Hardufnin Hatzitzit". It is common in the middle east with 150 different types, while in Israel there are 9 different types. See reference. In many parts of the site, such as the north hillside, are clusters of cactus. 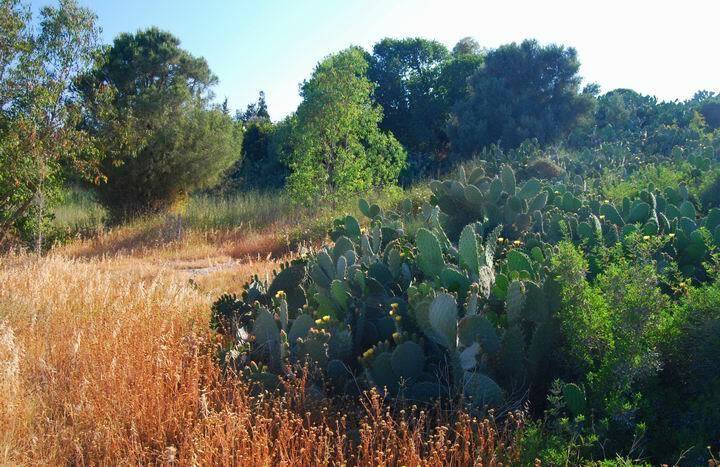 These cactus were useful as fences and are common in many ancient sites. During the end of the summer you can pick their sweet fruits (Sabre)- but beware of these tiny thorns. 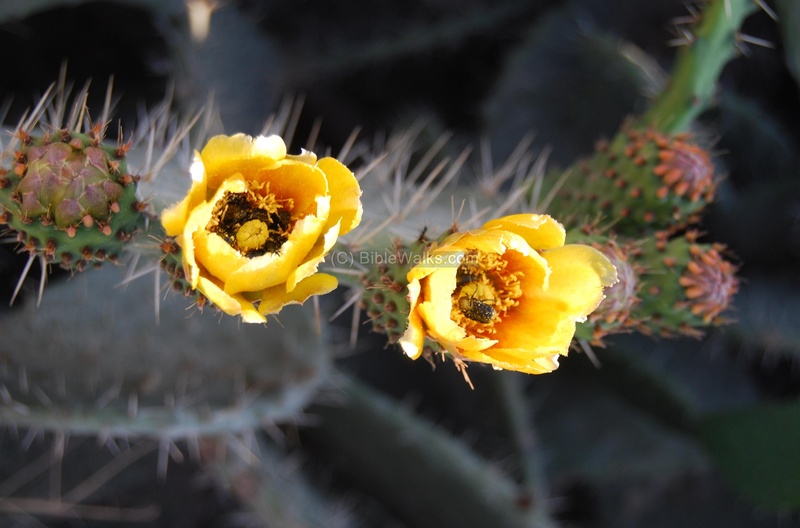 A close-up on the flowers of the cactus, with bees inside the flowers sucking up nectar. 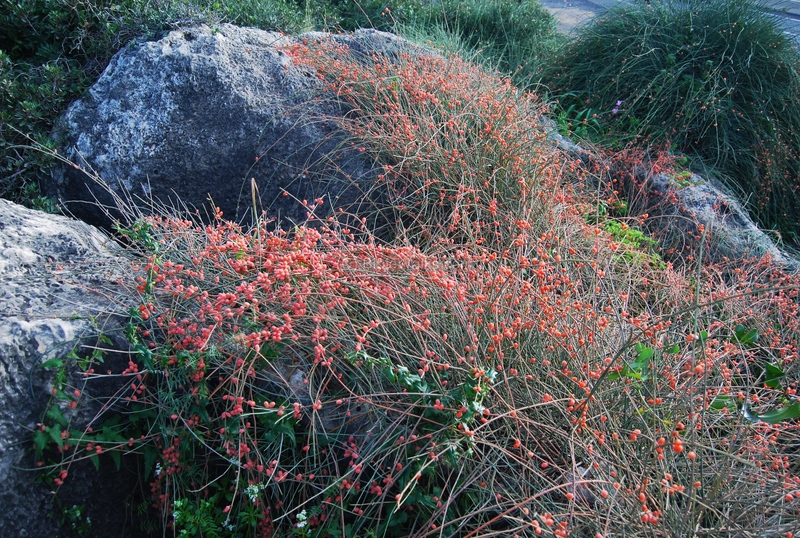 Another interesting bush is seen below with flowers during the winter. 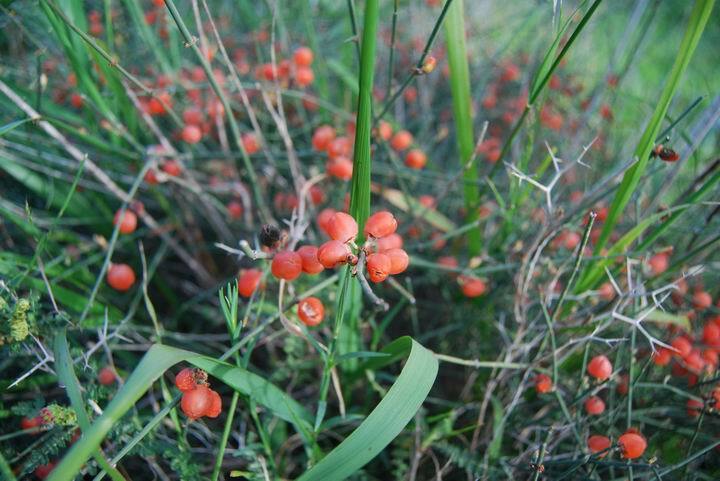 This is an Ephedra plant ("Sharvitan" in Hebrew) and its type is foeminea-Forssk (Matsui - "common") . The Hebrew word "Sharvit" means scepter - since its leaves are long (and magical, since the plant is used for medicine). See reference for details. A closer view of the colorful plant is seen below. An interesting event, which is reported in the Flora link, happened in the wailing wall in Jerusalem in 2002: reports indicated that the walls were "crying". It was found by a botanic expert that a bush of this Ephedra grew in the cracks, and during summer time it dropped water down to the prayer area. Malcha, Milcha - Arabic/Hebrew, based on the word Melach - salt. 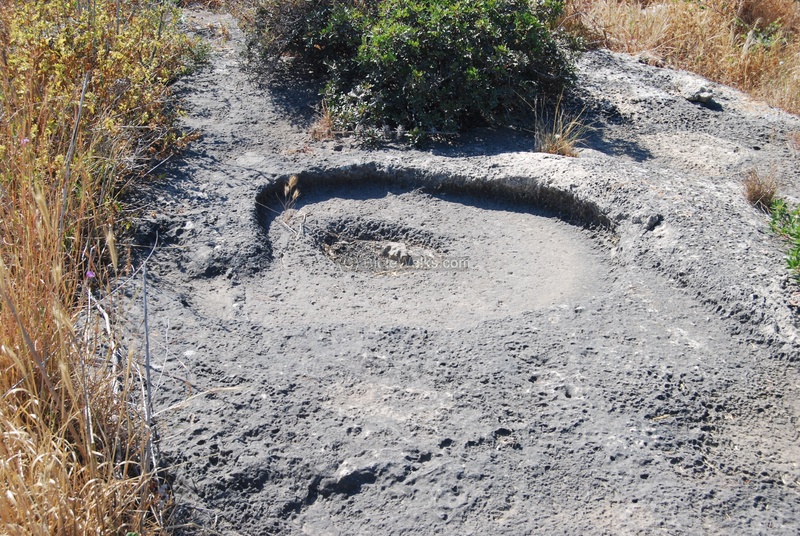 The area was a center of the ancient salt industry. Even today, the Israeli salt in the area - in Atlit - is made a few KM away. Migdal - Hebrew: tower. There are many sites with this prefix, such as Magdala. Abreik - In Arabic - small pitcher or vase. Such vases were in use during prayers. Arch. Survey of Israel - Atlit Map (24) - A. Ronen, Y. Olami  , site: #133 (prehistoric finds), site #123 (Kh. Maliha); site #124 (Sheikh Bureik/ Abrak), site #125 (Byzantine findings east to the site), site #131 (Turkish bridge west of the hill), site #132 (passage cut), site #134 (installations south of the site). Jerusalem Talmud (Hebrew; Demai Chapter 2, 1 page 8).- reference to "Migdal Milcha" at the edge of Caesarea. Viper's grass - from the guide to Israeli wild flowers.